"I'm on a date, and I like this girl. Can't we do this tomorrow?" Focus World has debuted a trailer for the new romantic comedy Mr. Right, about a lovable goofy girl who ends up with a guy that seems perfect until she discovers he's a hitman gone rogue. We all know how this is going to turn out, right? Of course after some bumps in the road and scary moments, she's going to live happily ever after with him, there's no doubt about it. That's always how these films end. 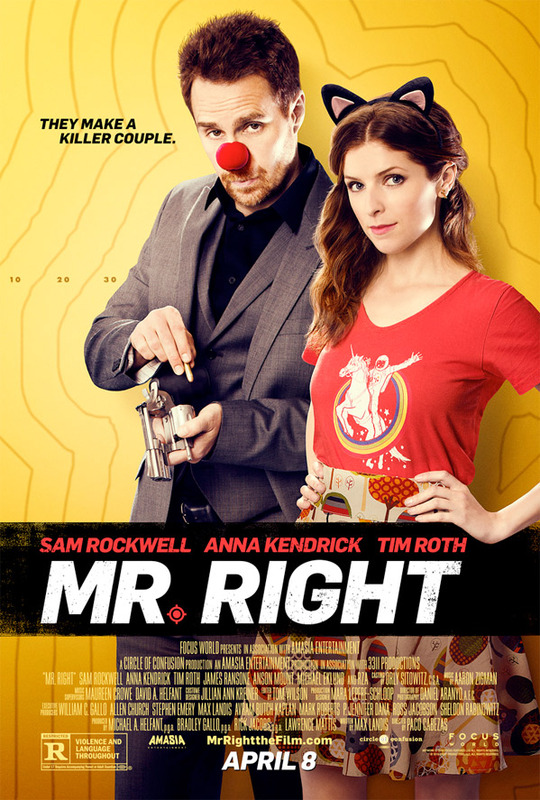 Anna Kendrick stars along with Sam Rockwell, and a fun cast including Tim Roth, Anson Mount, James Ransone, Michael Eklund, Katie Nehra and RZA. Despite my love for these two lead actors, this movie looks as formulaic and bland as can possibly be. Enjoy. After a going through a painful break up, a young woman (Anna Kendrick) meets a man (Sam Rockwell) who appears to be perfect for her. However, as their relationship develops, she learns that he is a former hitman. Their new, but genuine relationship is tested even further as they try to save each other after his dark past comes back to haunt him. Mr. Right is directed by up-and-coming Spanish filmmaker Paco Cabezas (of Neon Flesh, Rage and "Penny Dreadful" work previously), from a screenplay written by Max Landis (of Chronicle, American Ultra previously). This first premiered at last year's Toronto Film Festival. Focus World will release Mr. Right in select theaters starting on April 8th this spring. Anyone interested? Someone owes me bandwidth money. This looks horrible in every sense. I really like Sam Rockwell, but ... what is this?